Did I give you enough time? Need some more? Think of any? Yeah, didn’t think so. Blue foods are a rarity. Unfortunately for the USA, it is included in our awesome flag. 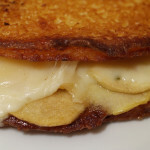 For this grilled cheese, I wanted to create a “red, white and blue” grilled cheese sandwich in honor of the 4th of July. Previously, I created the Patriotic Grilled Cheese, consisting of red peppers, fresh Mozzarella and blueberries, for Memorial Day, but that was a simple and obvious grilled cheese. 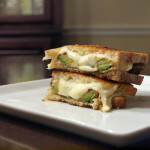 I wanted to push the envelope and try something new with this Red, White & Blue Grilled Cheese. The sous chef and I had multiple employees of Heinen’s, a local grocery store, wracking their brain, trying to think of blue foods. I was trying to find blue corn meal to make blue bread, but that thought quickly failed. (Is there such a thing as blue corn meal?) Blue corn tortilla chips were definitely a good option except I have already used tortilla chips twice. I wanted something different. I wanted purple potatoes for this grilled cheese. 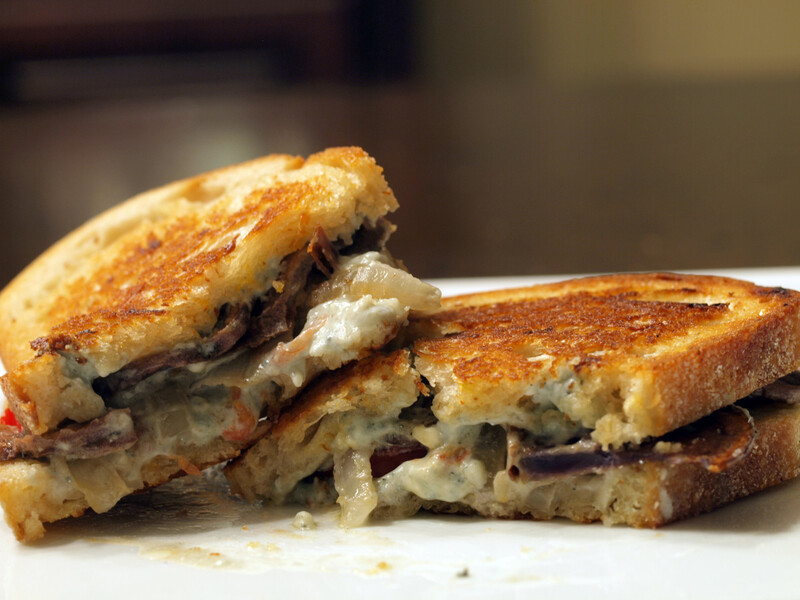 In my experience, people either love or hate blue cheese, there really isn’t any in between. When I was younger, I was freaked out by blue cheese, but over time as my tastes matured and expanded, I found myself loving blue cheese. Yes, it can be strong, but it can also be delicious when used correctly. For some reason, I did not want to use straight blue cheese, and I needed a true white color, so I mixed the blue cheese with cream cheese. 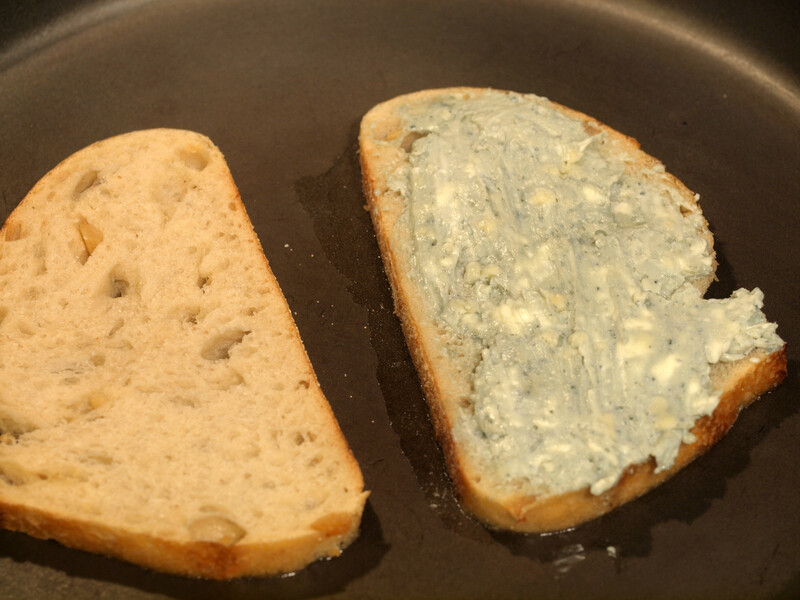 The amount of cream cheese used depends on how strong you want the blue cheese flavor to be. But how would I prepare these awesome purple potatoes? The sous chef cut these and fried them like potato chips. I added a little salt to them right after taking them out and they were fantastic. However, it was a good amount of time prior to us actually using these chips in the grilled cheese, leading them to become soggy. 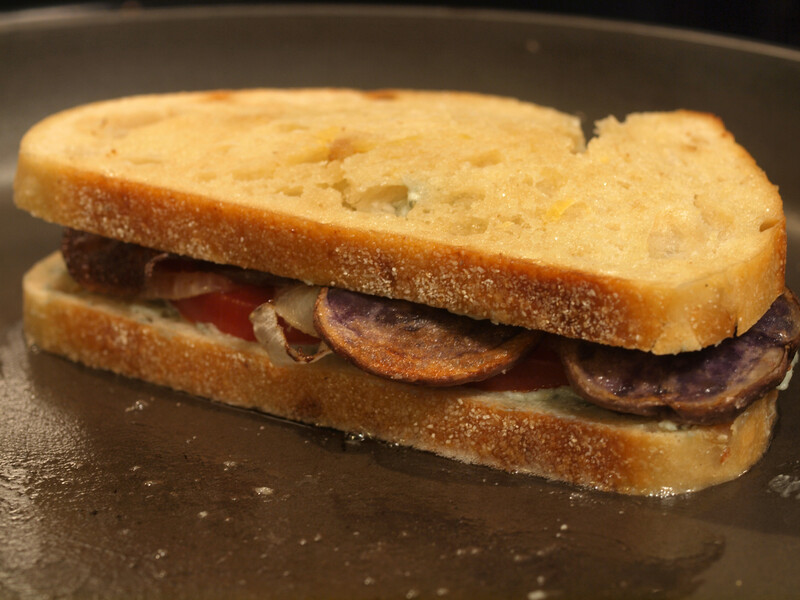 It would be my suggestion to get everything else ready and then right before composing your grilled cheese, I would recommend cooking the purple potato chips. 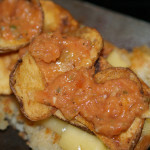 This would hopefully cut down on the sogginess of the chips and increase the crunchiness in the grilled cheese. The cream cheese is white, but I wanted a separate white item so I chose white onion. They are yummy after all so why not? Since we had just fried the chips, we went ahead and flash fried the onions. Once they were done, you could smell their awesome flavor. 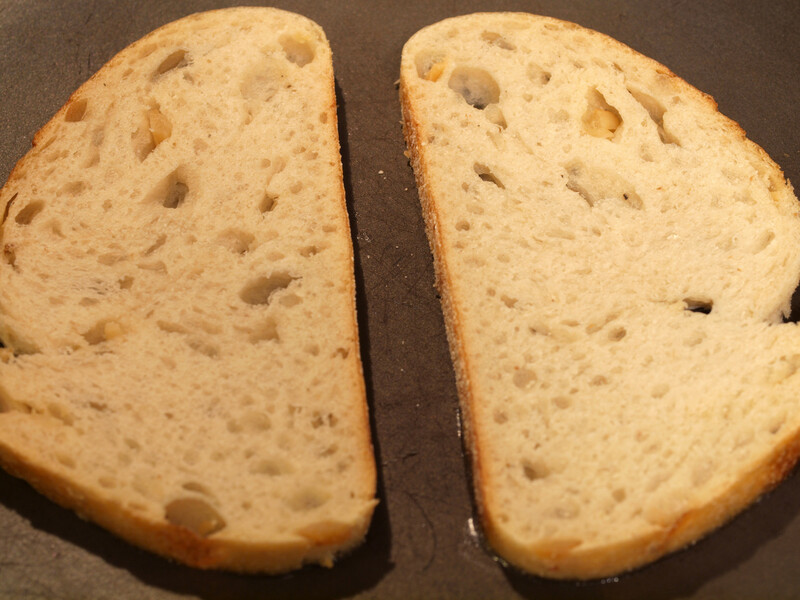 Bread with roasted garlic flavor and even a few pieces of actual garlic. The flavor was not overpowering and actually quite delicious. 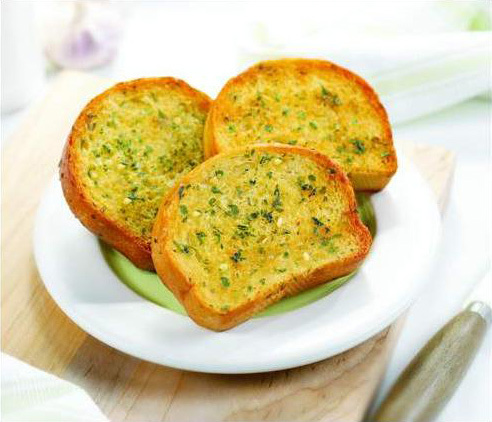 Remember though, I did not use typical garlic bread. 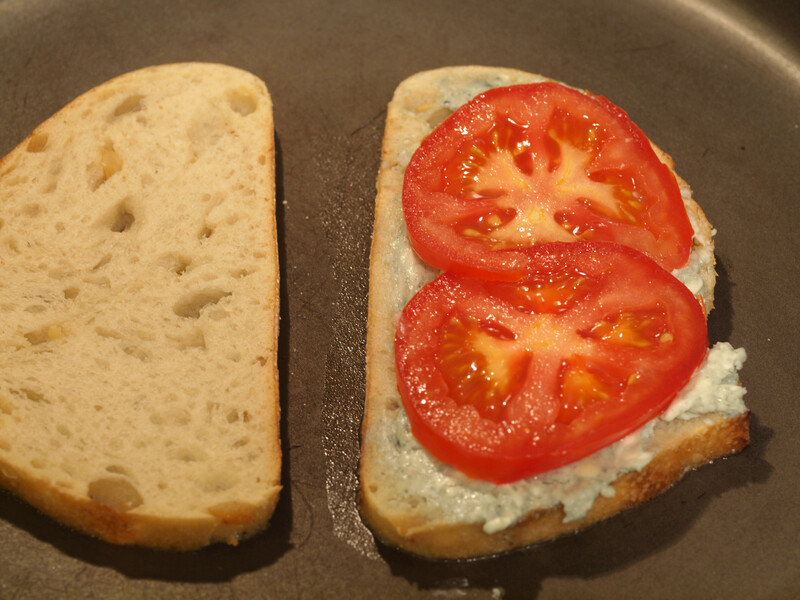 As you can see in the above photos, I spread the blue cheese/cream cheese mixture on both slices of bread. That was a mistake. 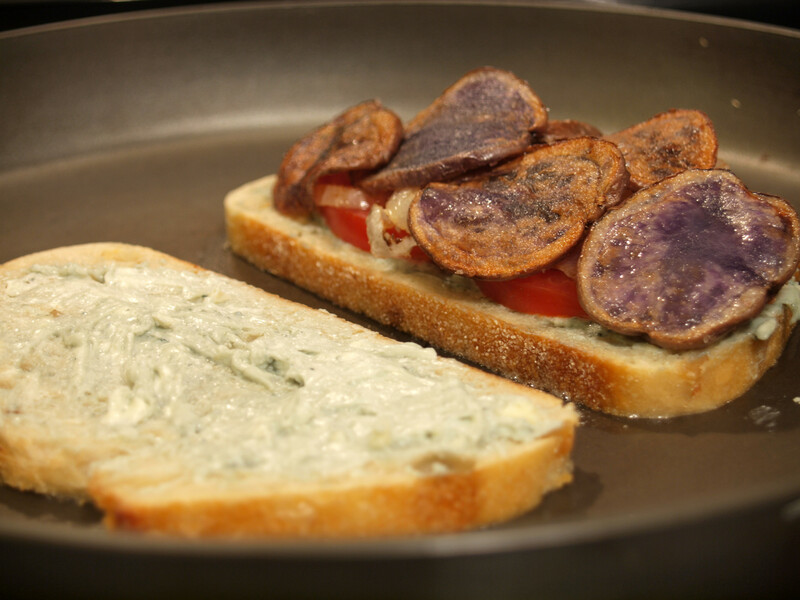 The blue cheese overpowered everything, including the potato chips (purple potatoes), onion and tomatoes. 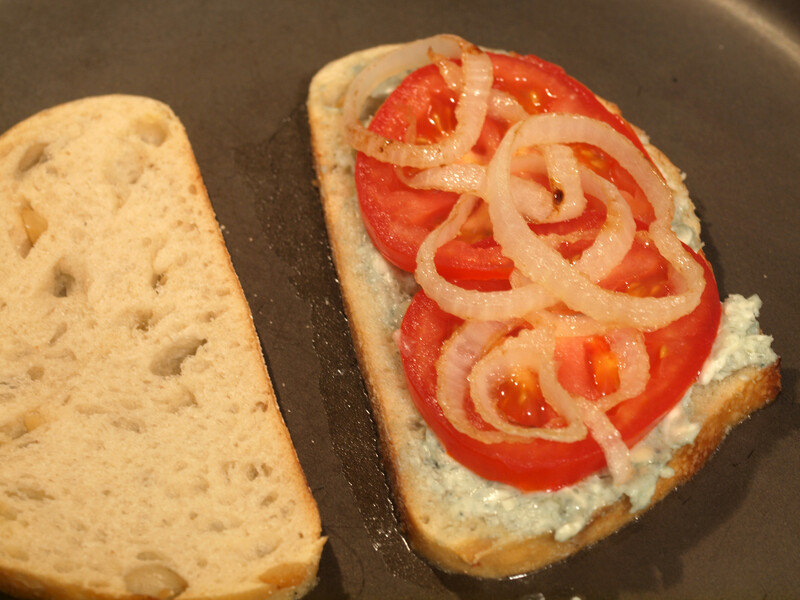 It was not bad in the least, I do enjoy me some blue cheese, but the other ingredients became useless. For the second half of the grilled cheese, I did scrape off some of the extra blue cheese and the grilled cheese was better. 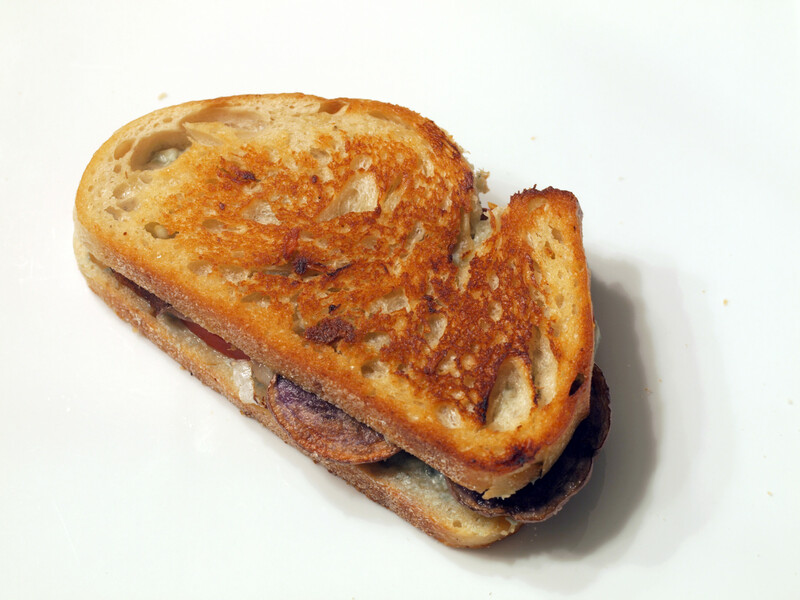 However, as soon as I was complete with sandwich #1, I cooked grilled cheese #2 in which I only spread the mixture on one slice of bread. 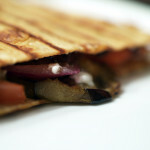 That made the sandwich infinitely better. Yes, it still had its downfalls like mushy purple potato chips, but overall, the various flavors (and textures) were actually present. 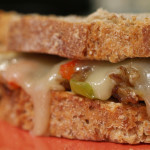 I am not sure how different I would make this grilled cheese for a third time, but some tweaking would definitely make it even better. If anyone has any suggestions, please leave them in the comments. Overall, a good effort. Everyone out there, please have a safe and enjoyable 4th of July! 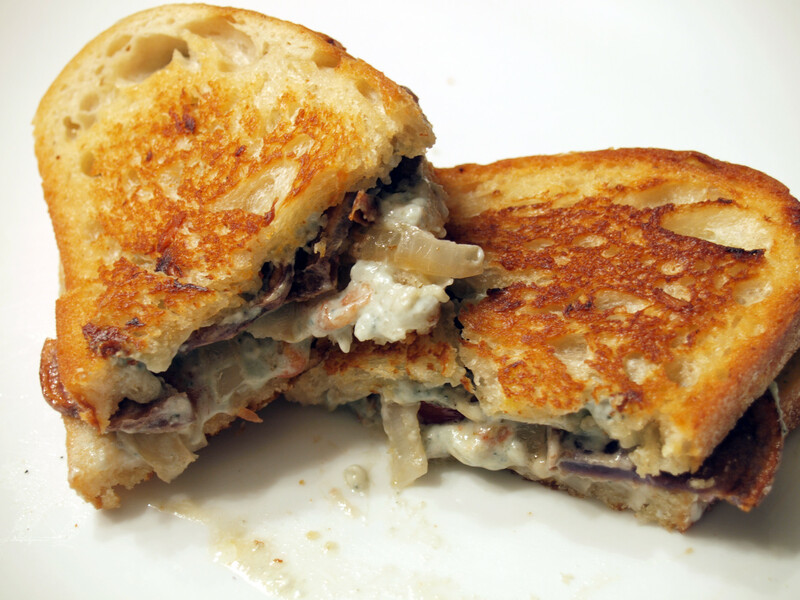 Posted in Grilled Cheese and tagged A Minus B Plus, blue cheese, cream cheese, fourth of july, grilled, onions, potato chips, potatoes, purple potatoes, roasted garlic bread, tomatoes, white onion.